The purpose of this publication is to provide illustrative examples of the more common mathematical calculations and statistical techniques utilized by reliability engineers in the practical performance of their daily activities. It is intended to be used as a companion to the RIAC “System Reliability Toolkit”, as the foundations of all of the techniques illustrated in this publication are discussed therein. As any practitioner in the field of reliability can attest, there exists a multitude of mathematical calculations and statistical techniques that can be used to assist the engineer in determining how system requirements should be allocated and how the system design should be modeled, assessed and re-designed in order to maximize the likelihood of satisfying the customer’s expectations or formal requirements. The purpose of this publication is to provide illustrative examples of the more common mathematical calculations and statistical techniques utilized by reliability engineers in the practical performance of their daily activities. 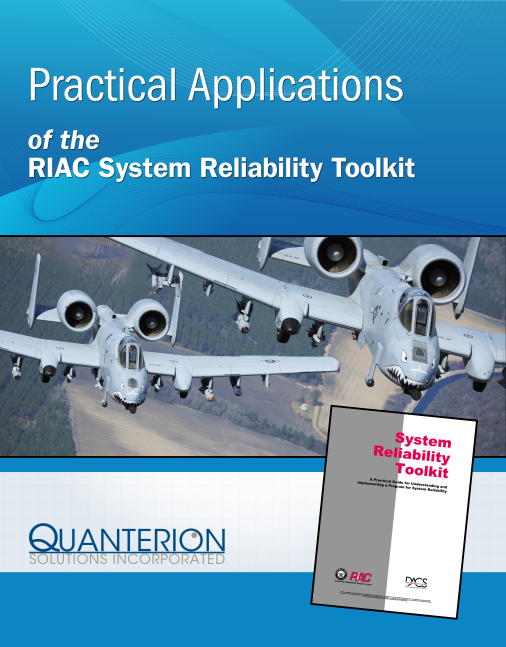 It is intended to be used as a companion to the RIAC “System Reliability Toolkit”, as the foundations of all of the techniques illustrated in this publication are discussed therein. The mathematical and statistical examples illustrated in this publication revolve around a single hypothetical case study, namely, a Flight Control System for a jet aircraft. In addition to providing a common thread throughout this publication, it is hoped that by basing all calculations on a single case study, the reader will come to understand that individual calculations do not exist in a vacuum. Rather, it will reinforce the notion that each phase of a project is linked to (and affects) other phases, and that conclusions drawn from a calculation are often used to influence design decisions, which may then require that previous analyses and calculations be revisited and updated. Copyright © 2014 by Quanterion Solutions Incorporated. This handbook was developed by Quanterion Solutions Incorporated, in support of the prime contractor (Wyle Laboratories) in the operation of the Department of Defense Reliability Information Analysis Center (RIAC) under Contract HC1047-05-D-4005. The Government has a fully paid up perpetual license for free use of and access to this publication and its contents among all the DOD IACs in both hardcopy and electronic versions, without limitation on the number of users or servers. Subject to the rights of the Government, this document (hardcopy and electronic versions) and the content contained within it are protected by U.S. Copyright Law and may not be copied, automated, re-sold, or redistributed to multiple users without the express written permission. The copyrighted work may not be made available on a server for use by more than one person simultaneously without the express written permission. If automation of the technical content for other than personal use, or for multiple simultaneous user access to a copyrighted work is desired, please contact 877.808.0097 (toll free) or 315.732.0097 for licensing information.